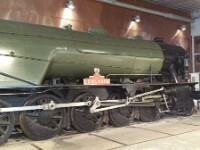 The British War department produced 935 2-8-0 and 150 2-10-0 locomotives to support the war effort after the invasion. 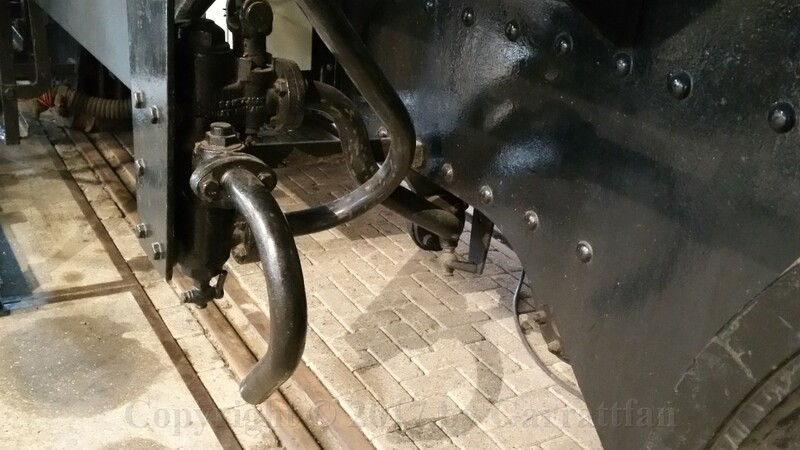 After the war they quickly became surplus to demands and the Dutch government acquired 184 2-8-0 and 103 2-10-0s, the latter almost two thirds of the entire class. 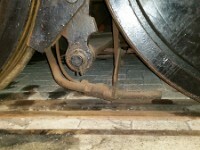 They did their job in getting rail transport back on track. 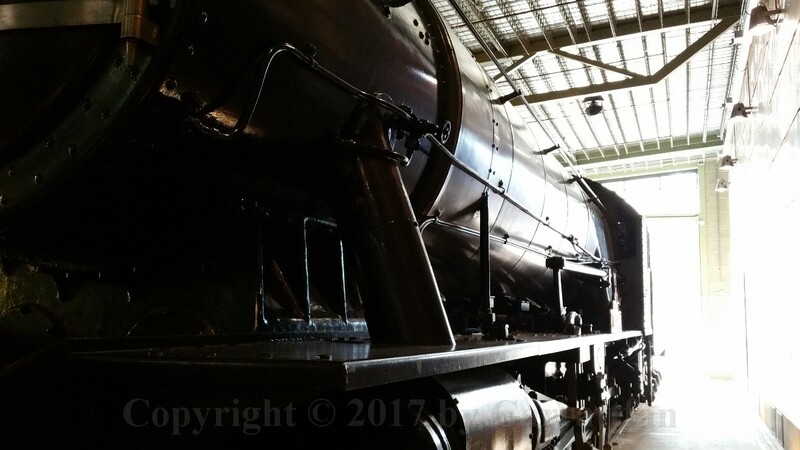 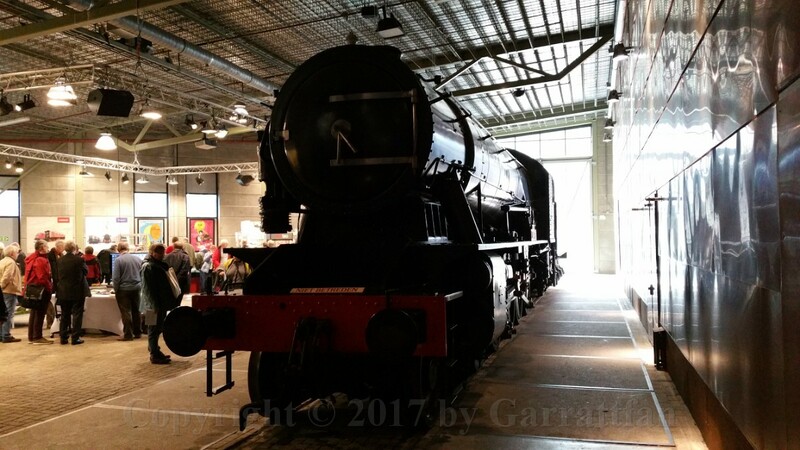 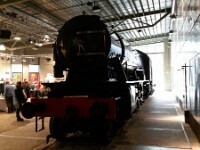 One 2-10-0 NS no 5085 resides in the National Railway Museum in Utrecht as the sole survivor of the 5000 class. 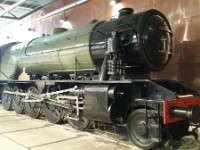 An NS4300 2-8-0 was sold to Sweden and now resides at the Keighley and Worth Valley Railway. 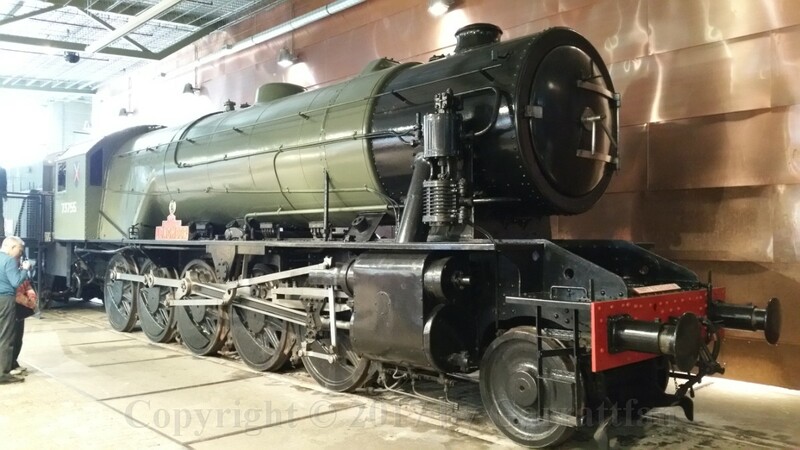 Other examples of the WD 2-10-0, but that were never in possession of the Dutch Railways, can be found in the UK, notably no 600 Gordon - Severn Valley, no 90775 - North Norfolk Railway and no 3672 Dame Vera Lynn - North Yorkshire Moors Railway. 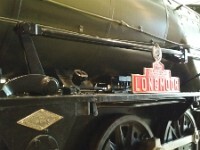 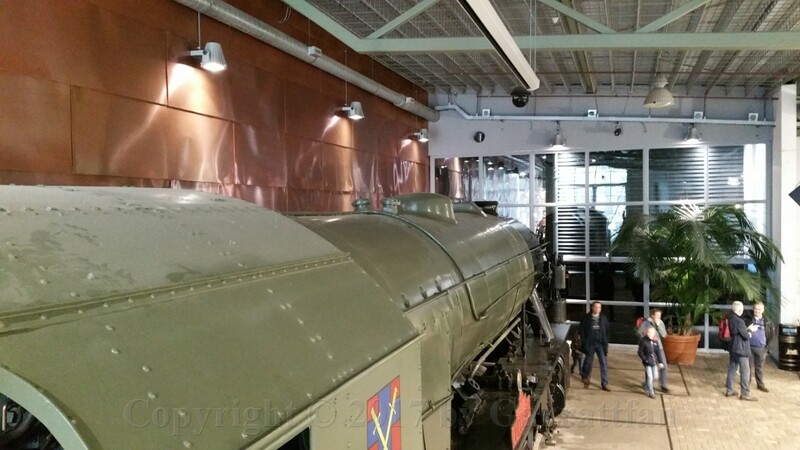 1 This locomotive is usually parked on an unkind and underrated space in the museum and very hard to get by. 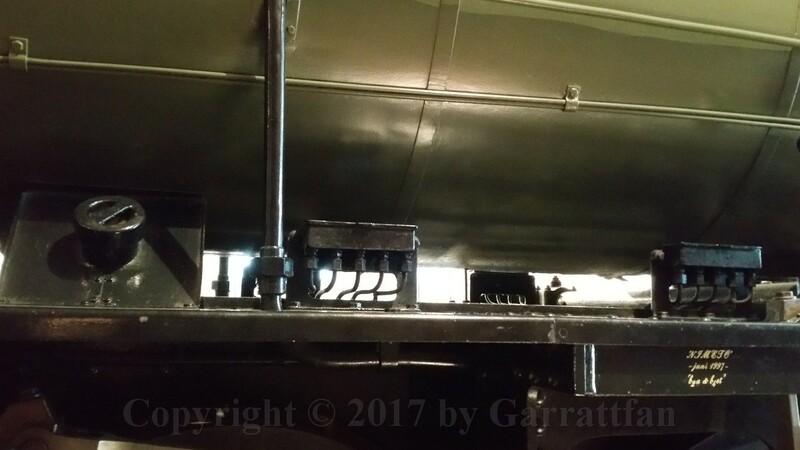 When I visited the yearly model railway event Ontraxs in the museum I incidentally found the loco on a spot where I had enough space to walk around it. 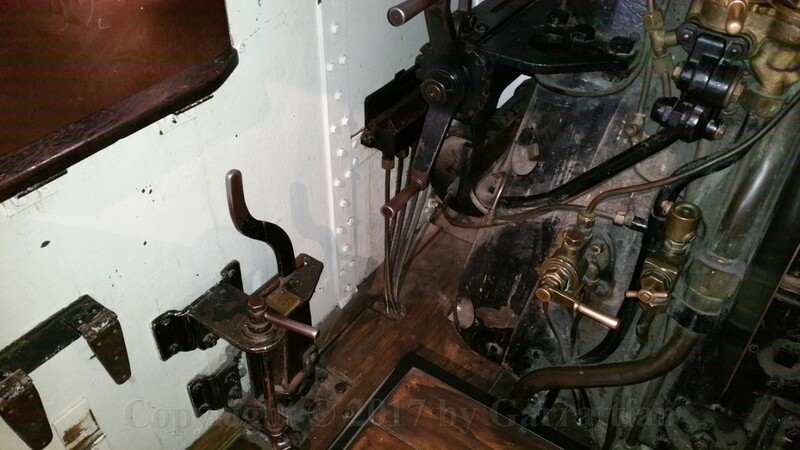 The lighting conditions were not favourable though. 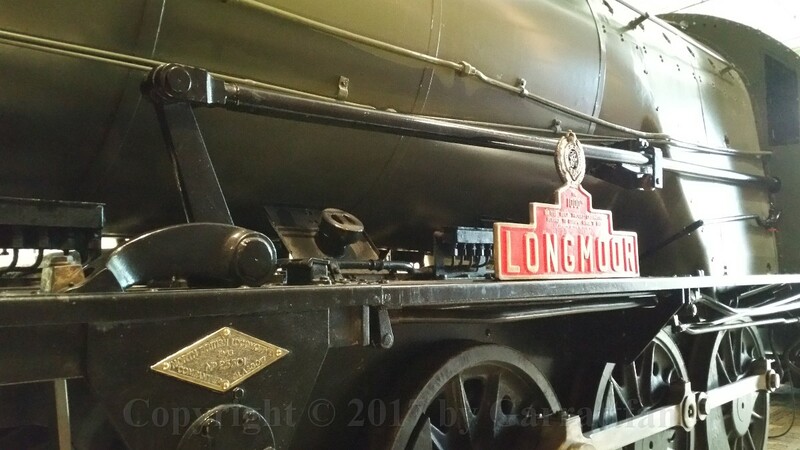 I had no tripod, no DSLR at hand so I had to make do with my telephone's camera. 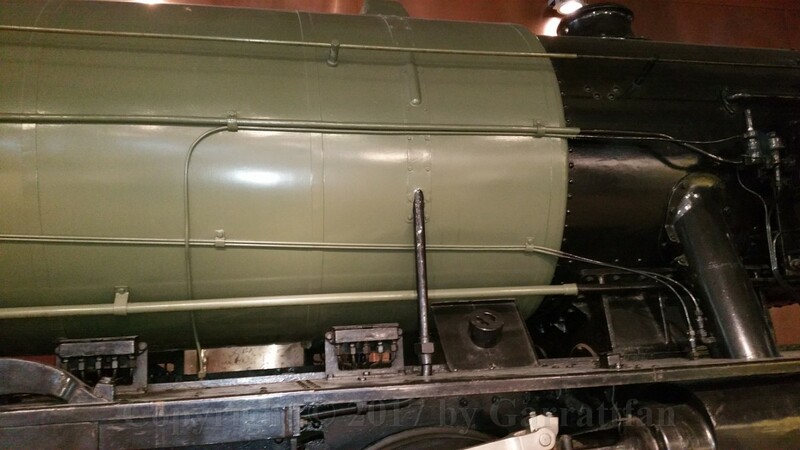 So the quality of the photos may be lacking here and there but I tried to cover as many details as possible because I have a DJH kit of the loco in store waiting to be built. 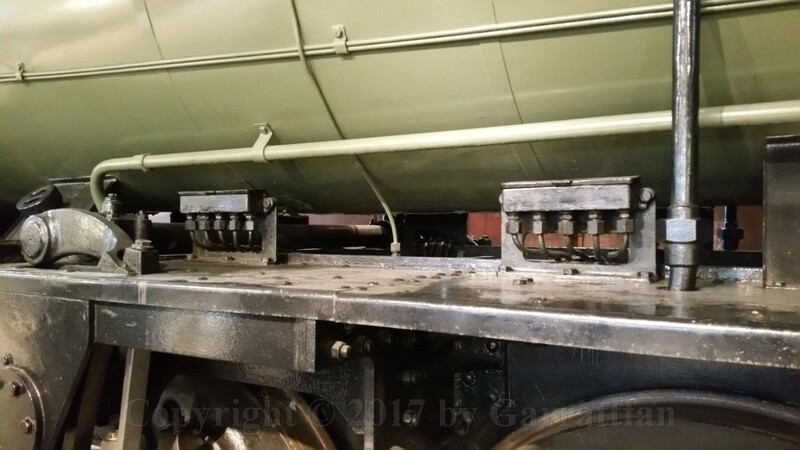 I'd like to share these photos for anyone who needs the details of this loco. 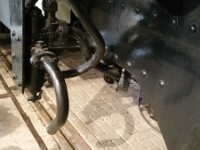 2 An overview of the loco form the right hand side (RHS). 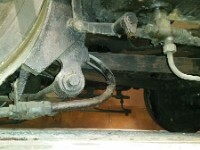 Note the middle axle has no flanges. 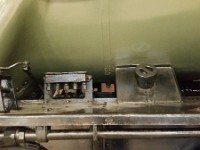 6 Gravity oil feeds (middle) and the filler opening of the rear sanding box. 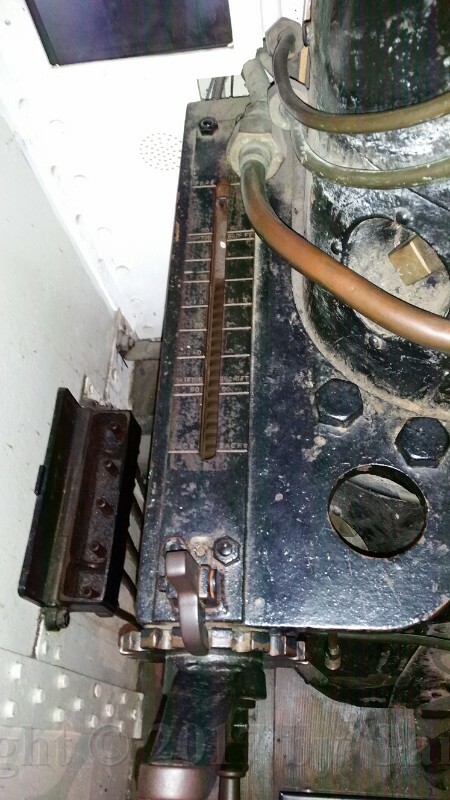 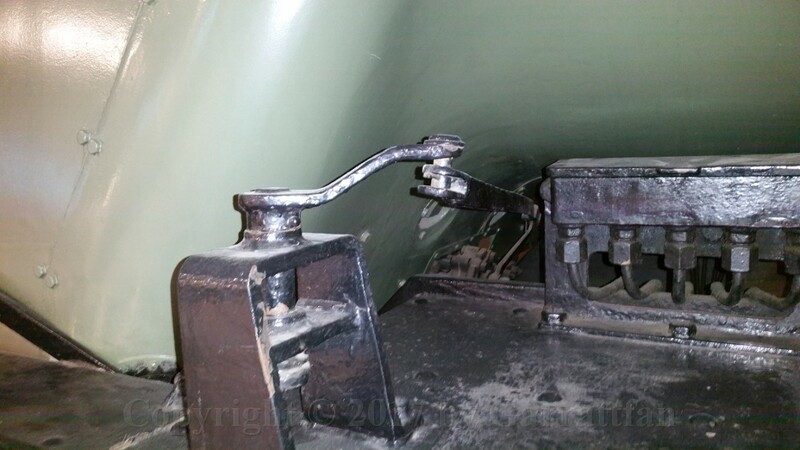 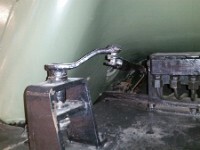 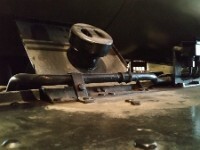 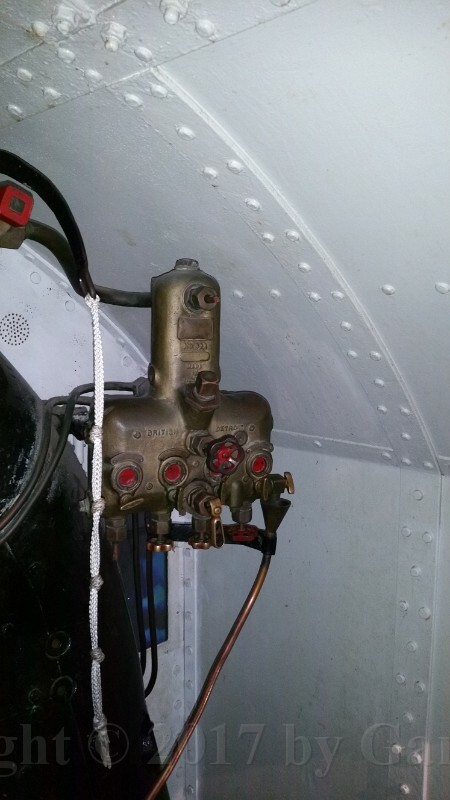 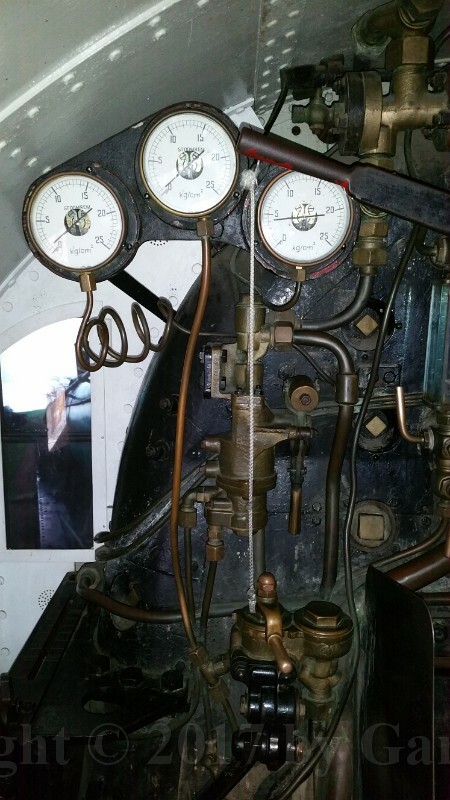 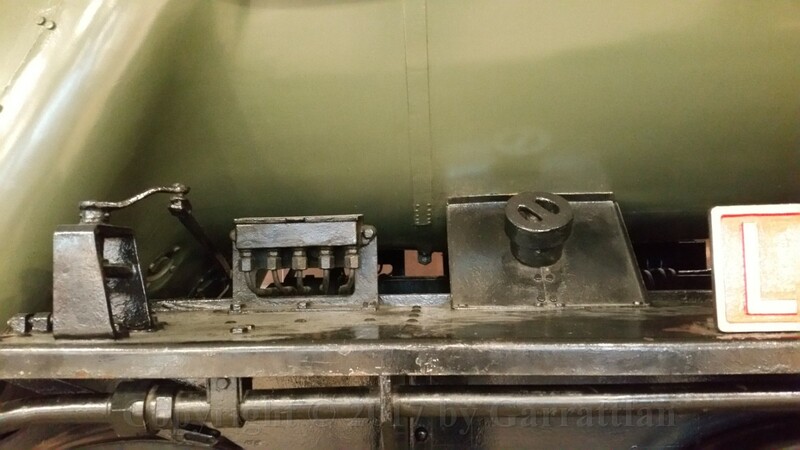 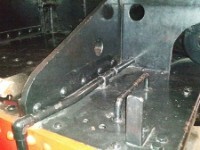 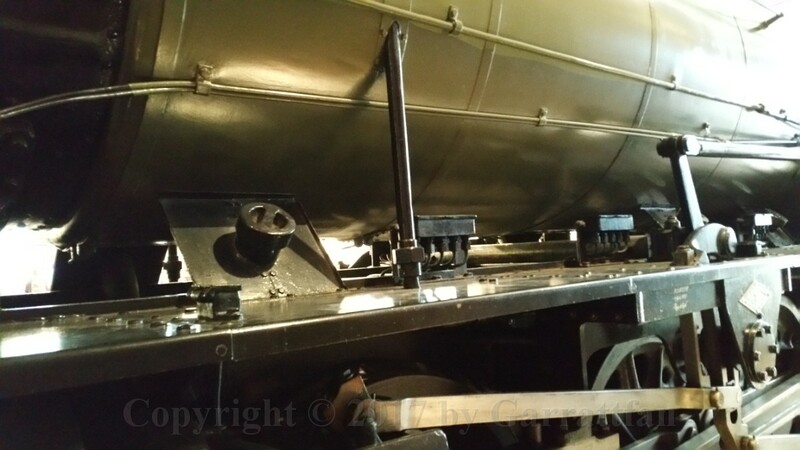 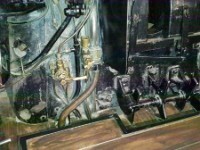 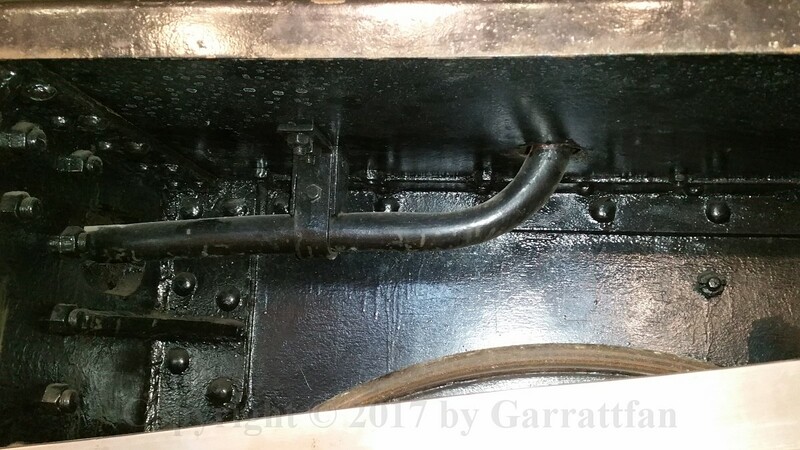 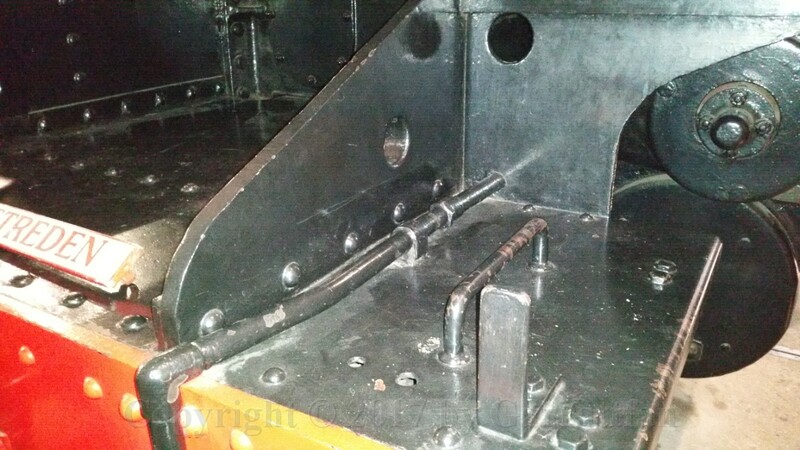 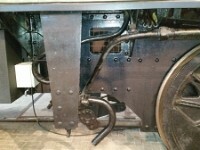 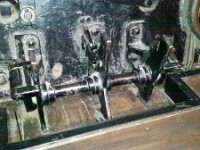 On the left there is a control lever which runs to the middle of the front of the firebox. 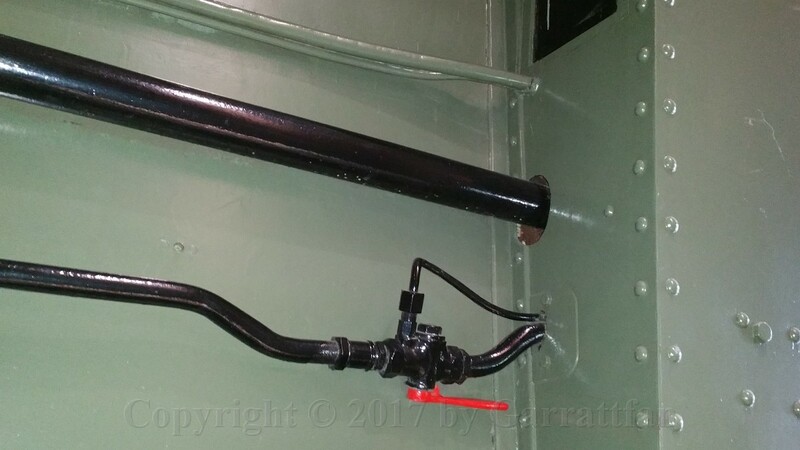 No idea whatfor, but it is disconnected. 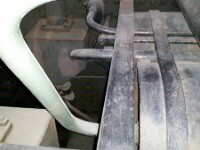 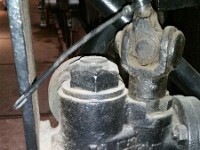 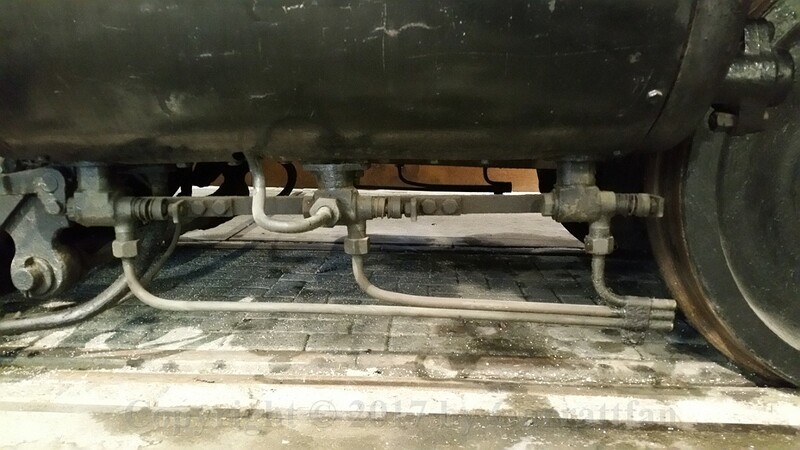 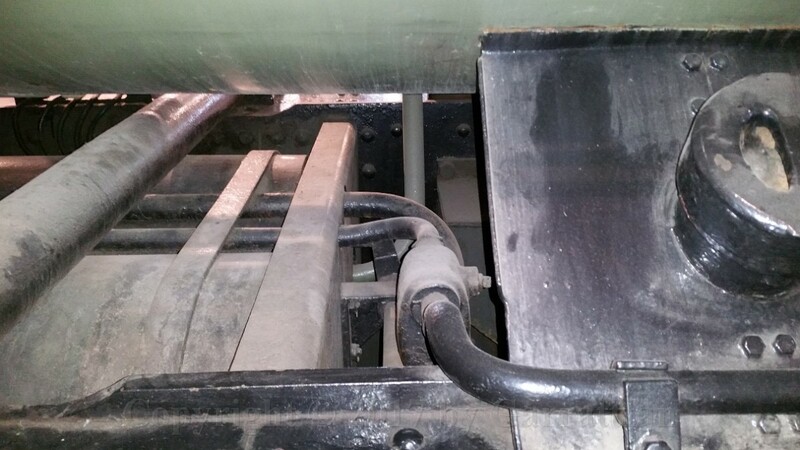 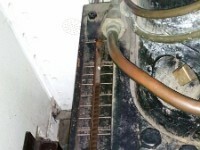 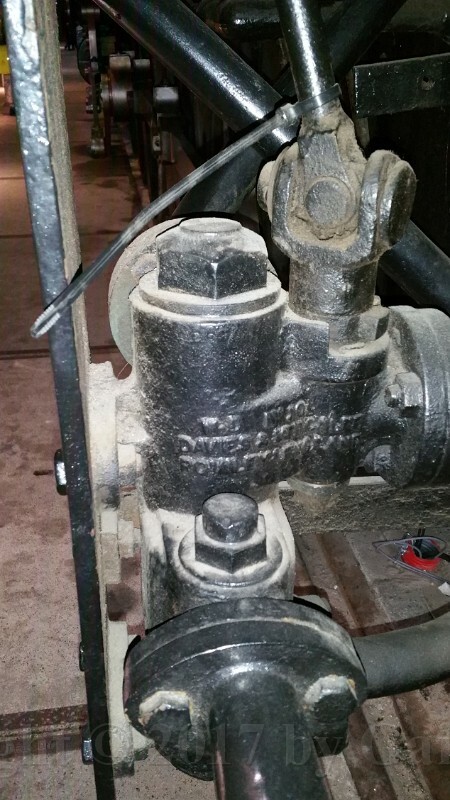 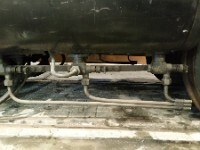 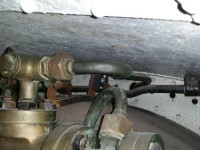 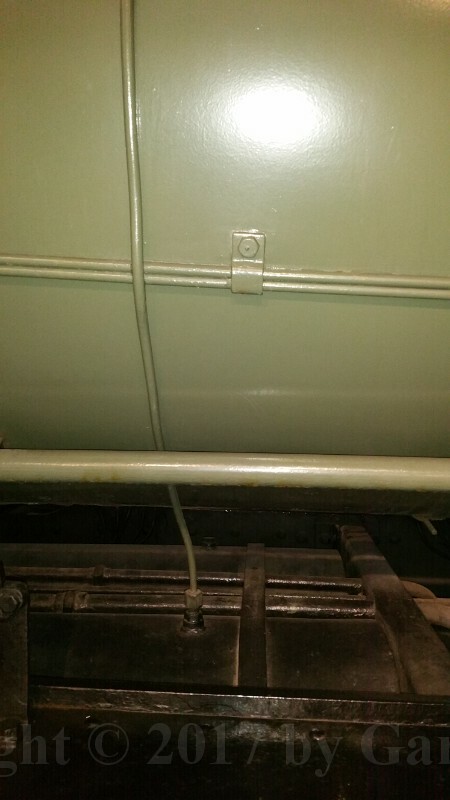 The rest of the lever can be seen dangling uselessly below the running board behind the feedwater pipe. 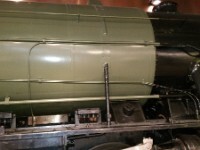 11 ... and it continues under the boiler cladding. 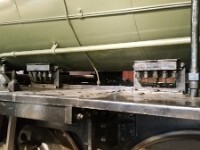 12 Two other views on that mysterious control just ahead of the firebox. 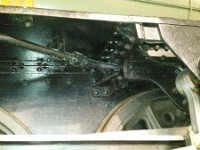 14 The second sanding box filler opening Second and third gravity oilfeed (middle and right). 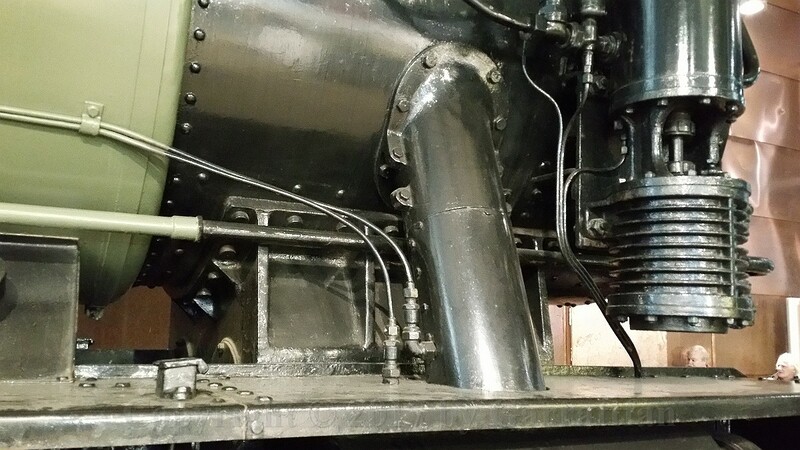 The feedwater pipe (right) goes straight up to the top feed clack valve on the boiler. 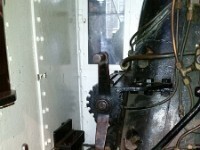 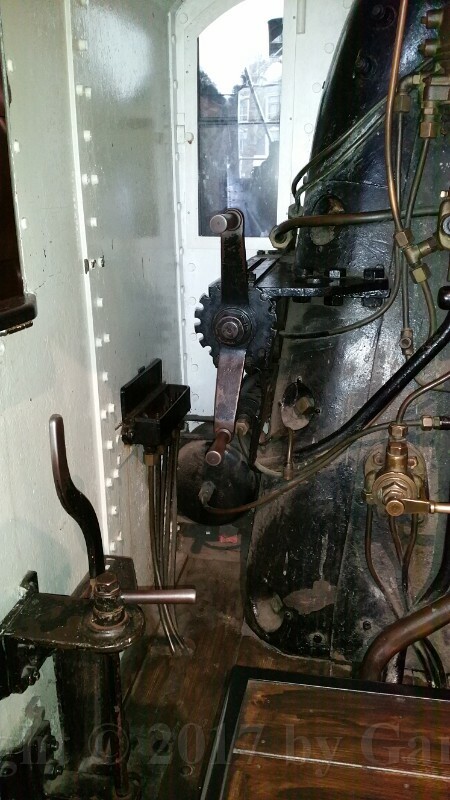 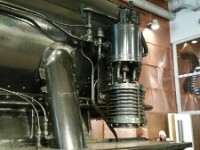 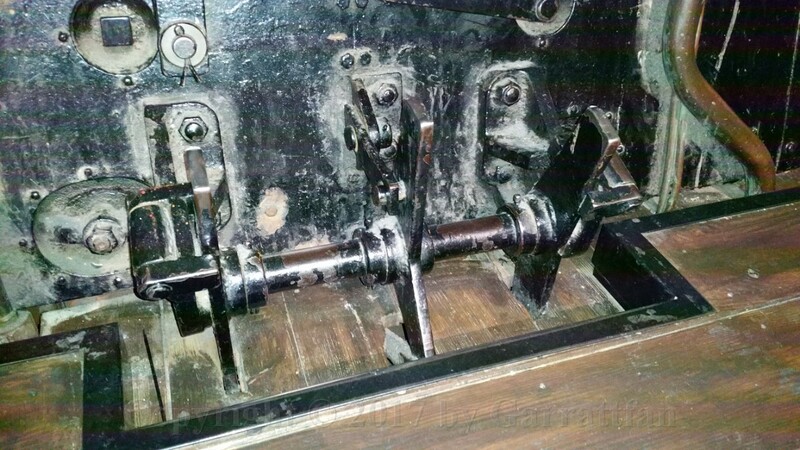 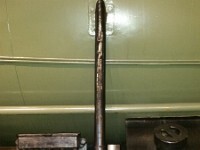 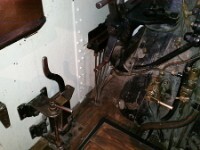 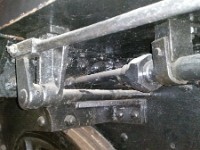 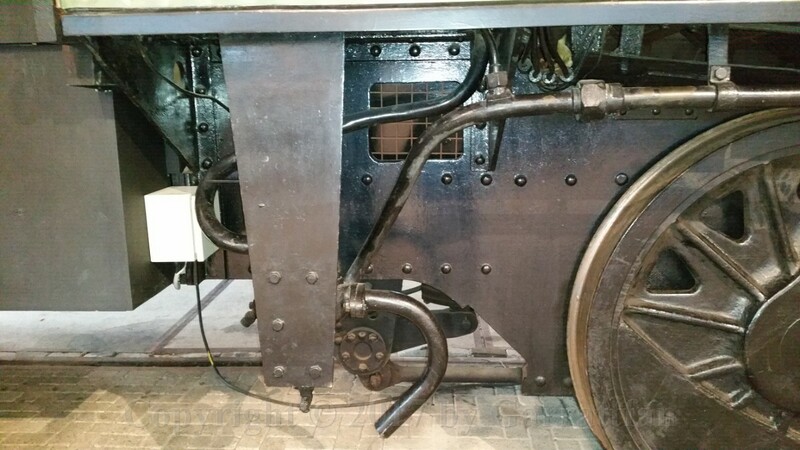 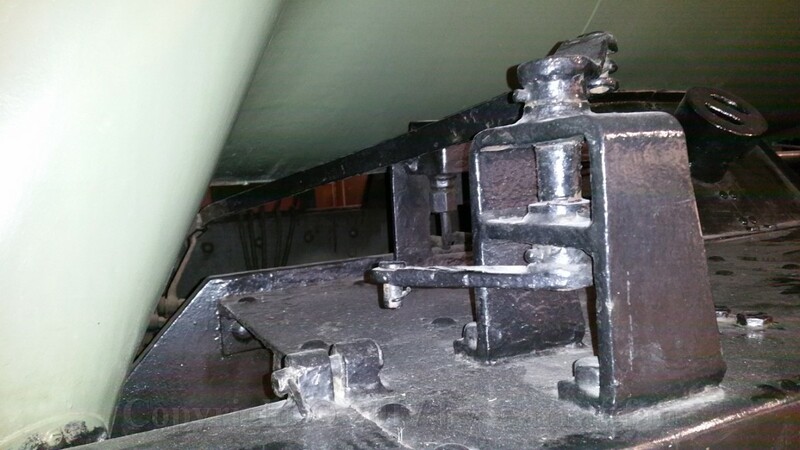 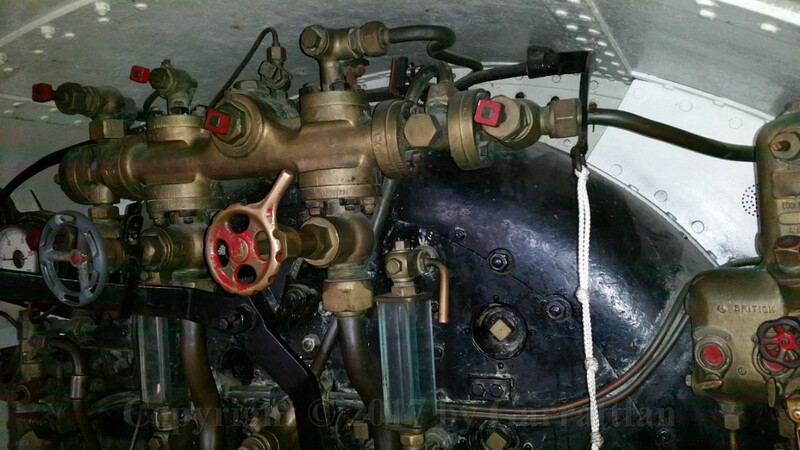 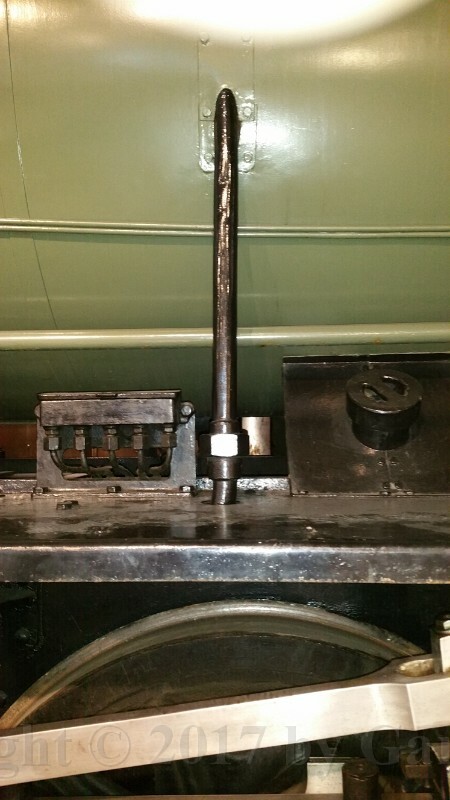 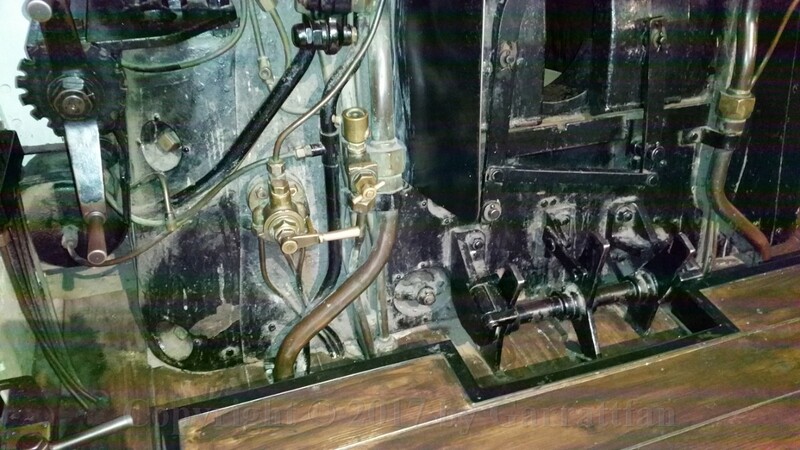 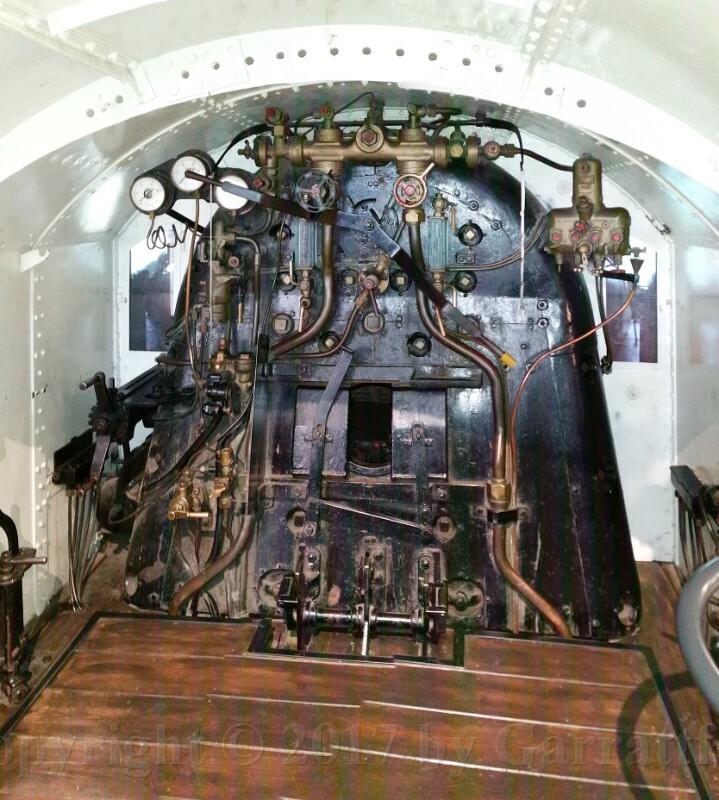 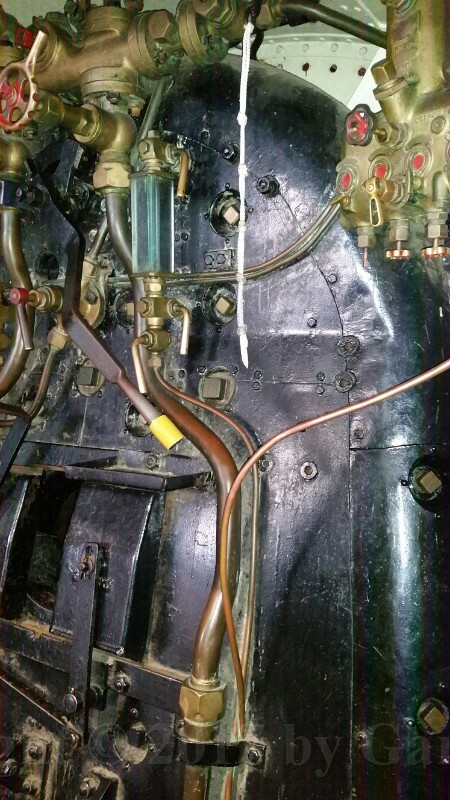 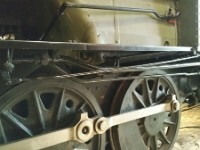 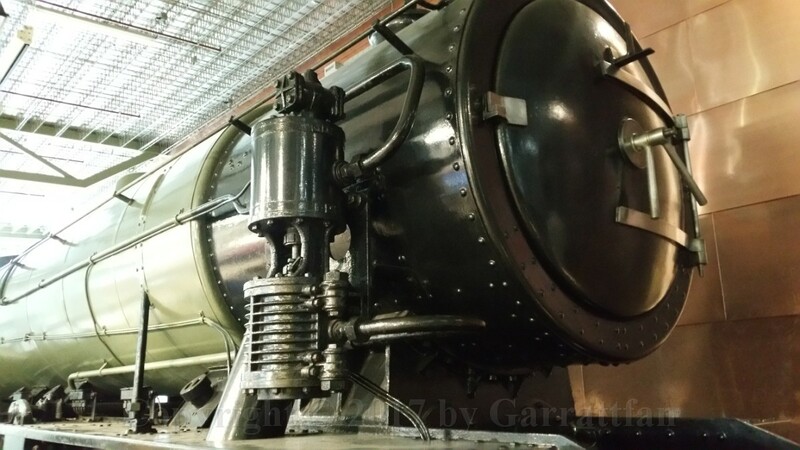 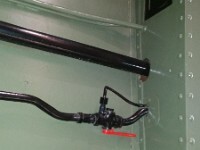 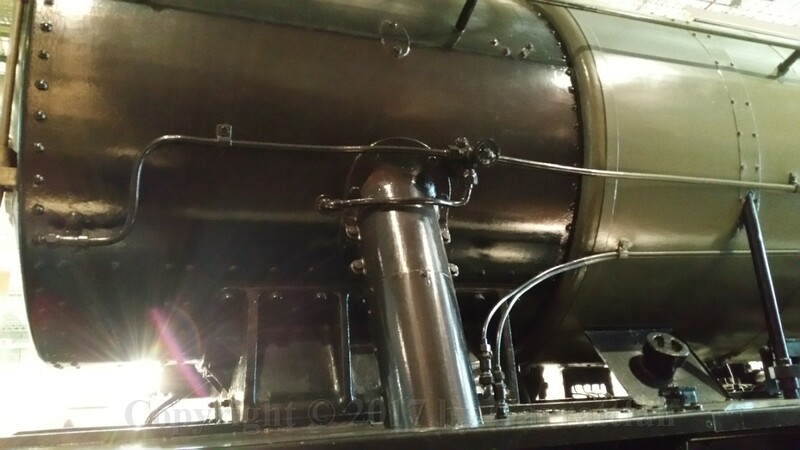 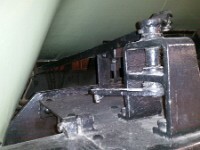 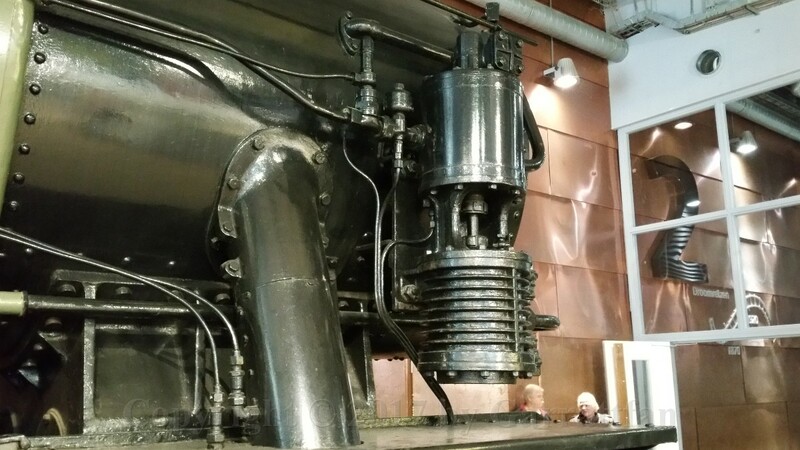 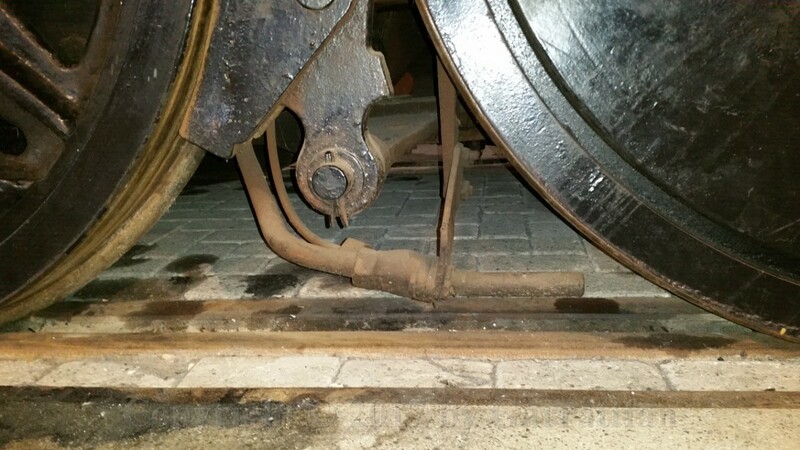 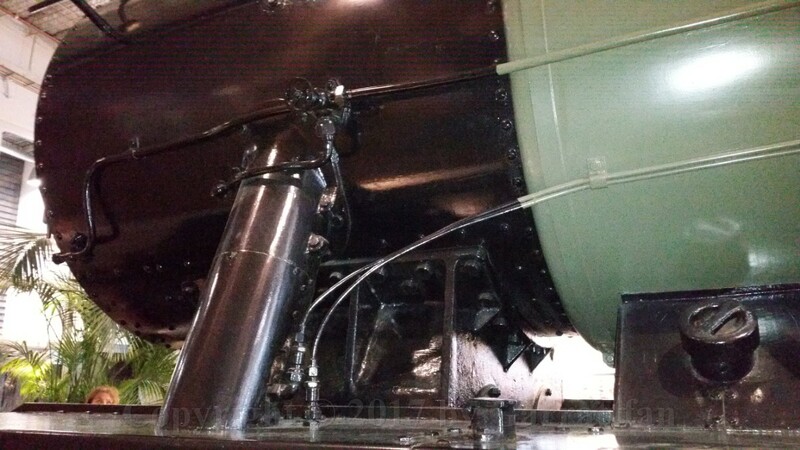 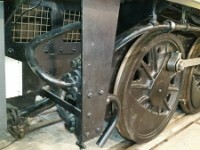 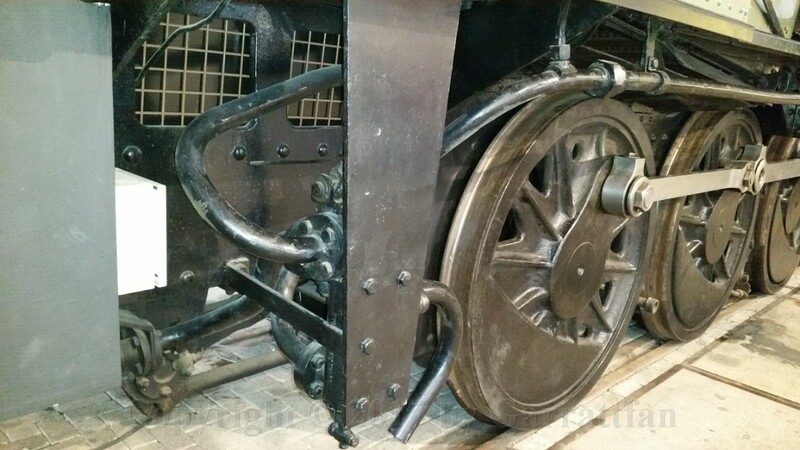 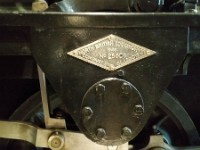 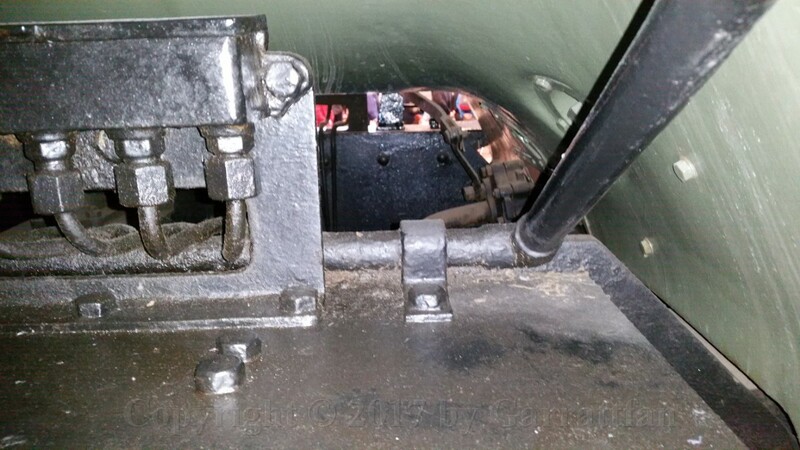 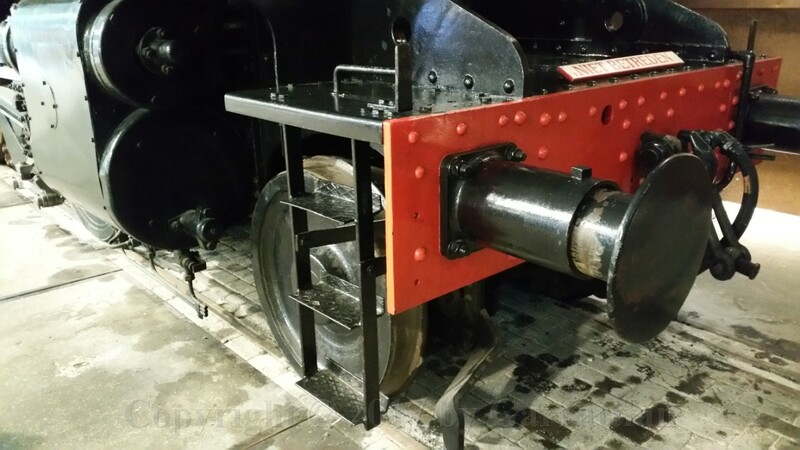 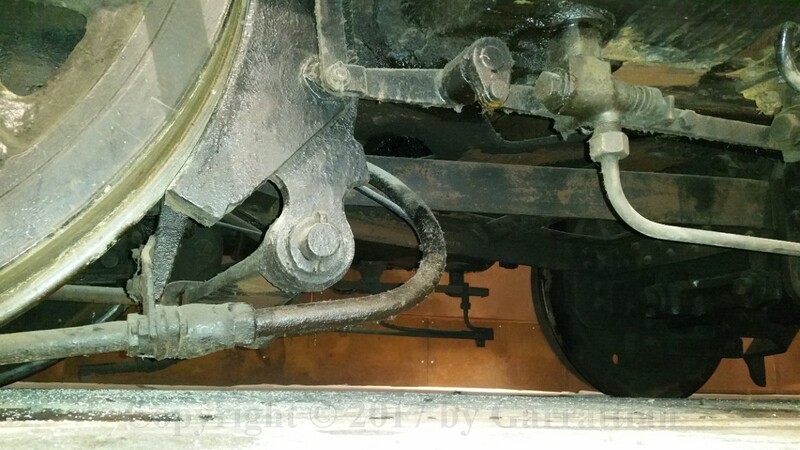 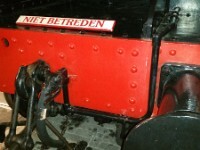 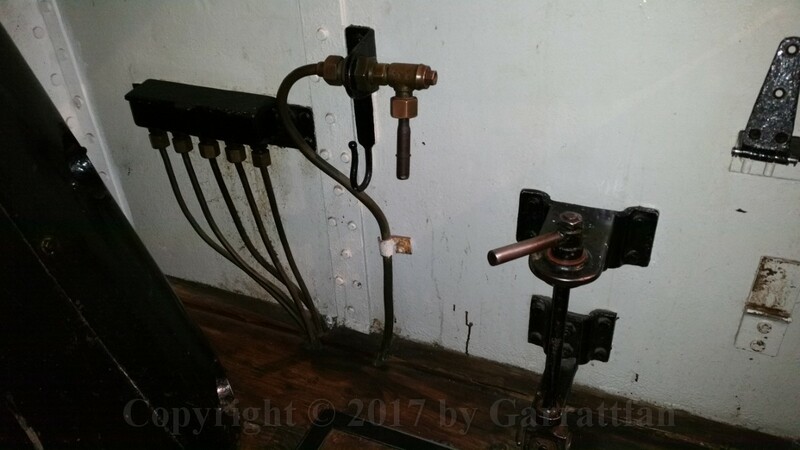 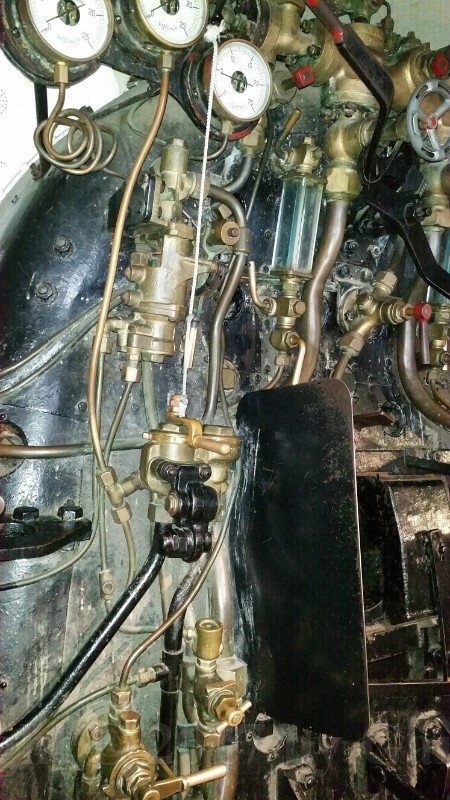 Also visible is the lifting arm for the Walschaerts valve gear with the lifting link (left) which is operated by a rod running under the boiler from the LHS. 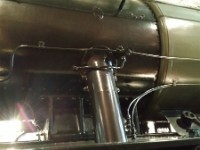 17 The first sandpipe is aimed to the first driver (left). 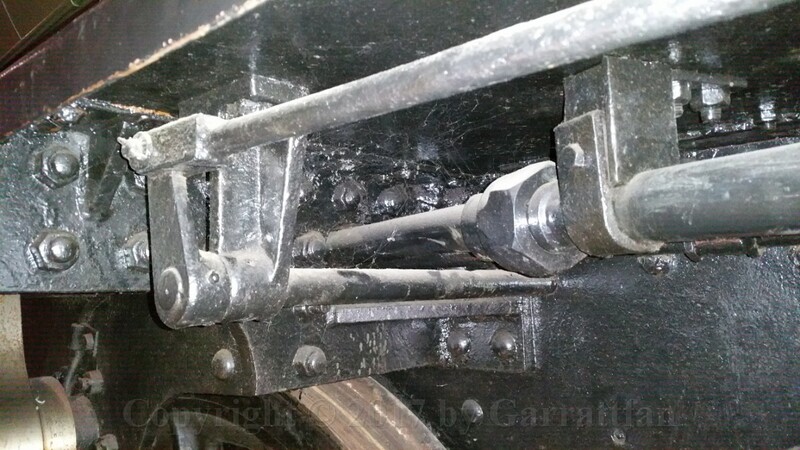 This shot gives a good impression of the triangular pony truck (middle). 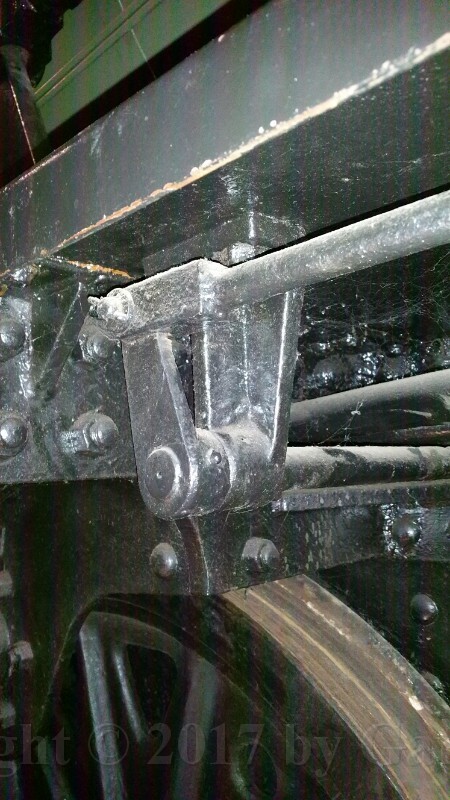 19 Some detail of the front pony truck. 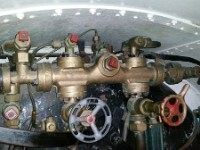 2. the automatic drain valve steers any condensated water away before entering the pump. 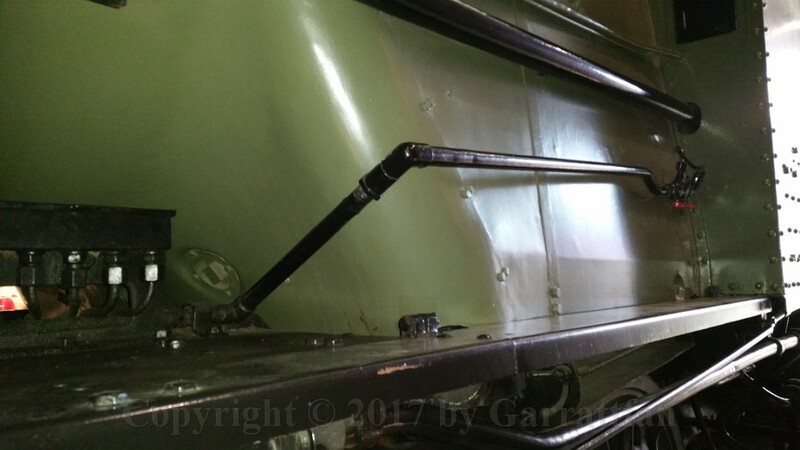 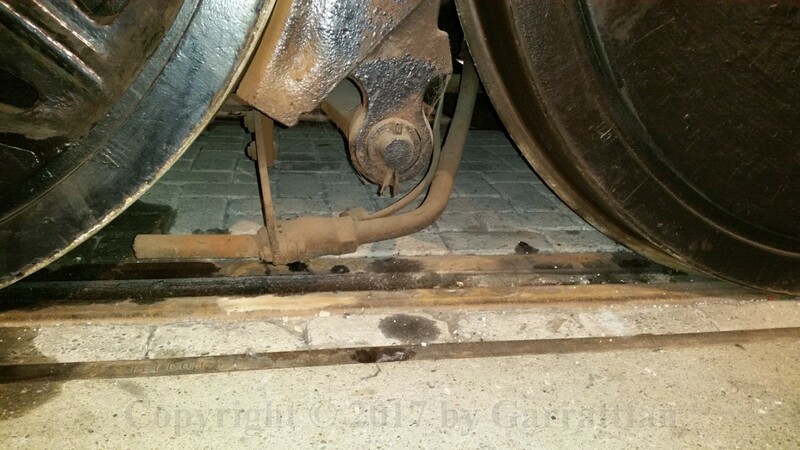 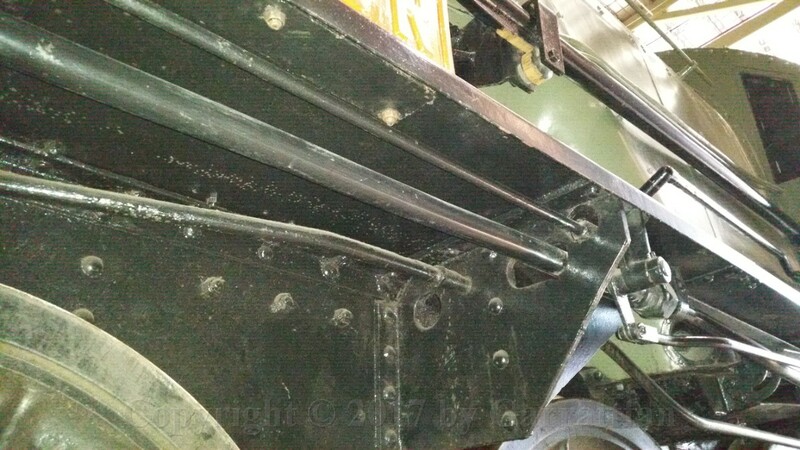 Three drain pipes run down below the running board. 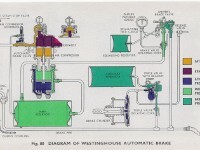 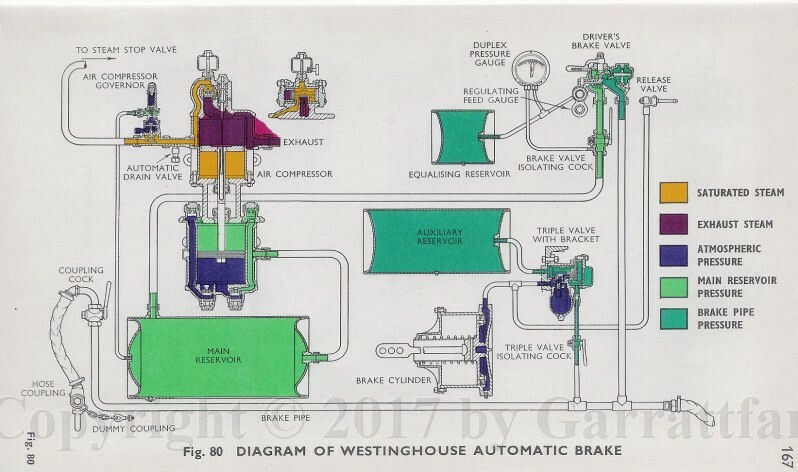 21 A scheme showing the the pump and the function of the various pipes. 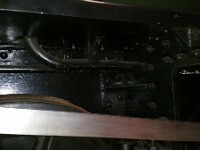 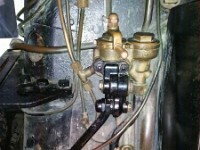 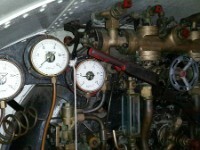 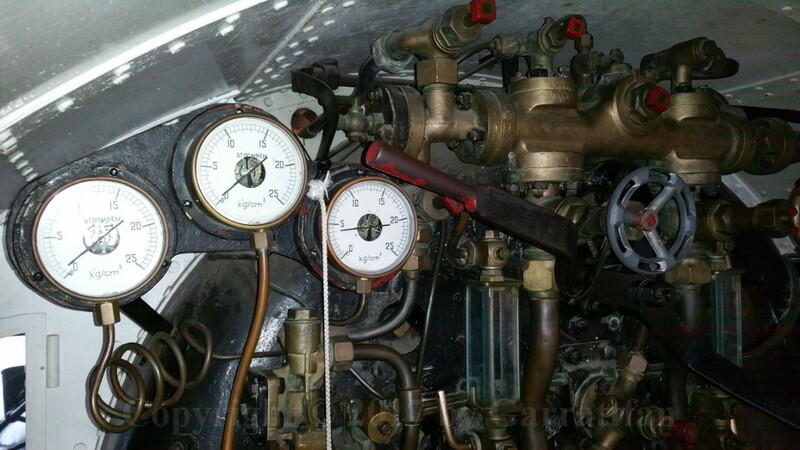 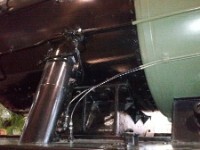 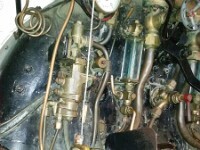 22 Fresh steam pipe to power the pump (left, the green pipe running along the length of the boiler). 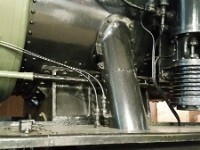 The exhaust pipe (top of the pump). 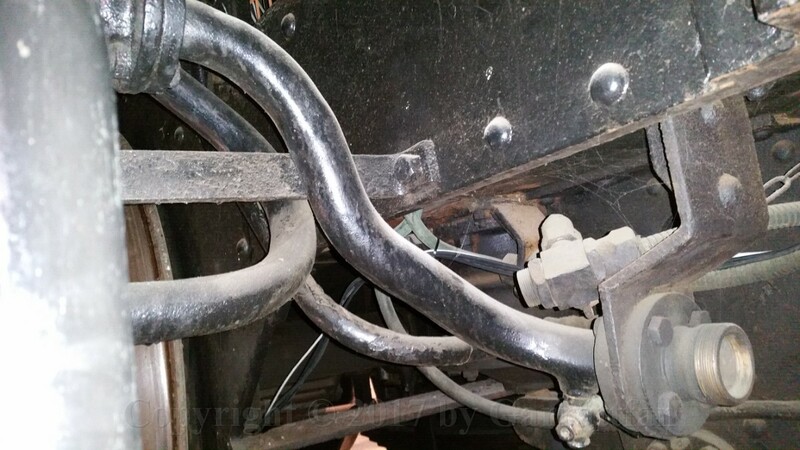 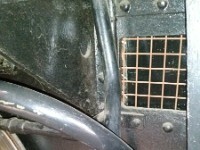 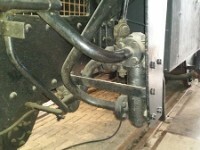 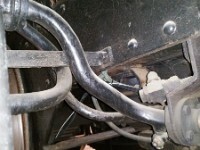 The air pipe to the brakes (bottom) leading to the rear to the air tanks which are situated between the frames. 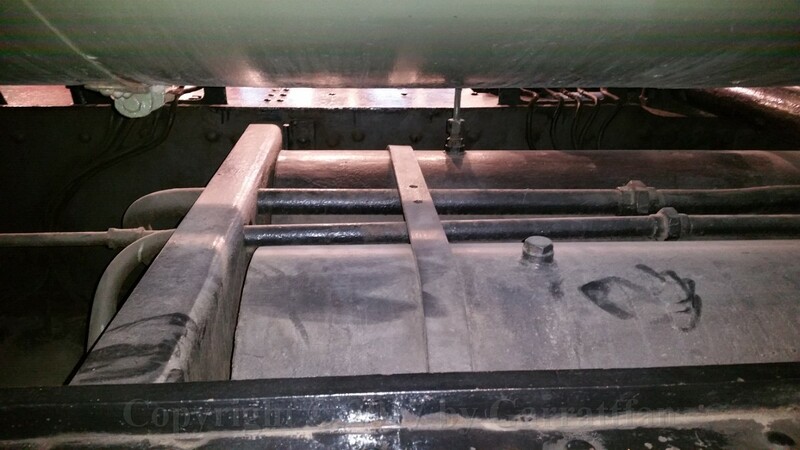 As a bonus you can see here all three sandbox filler openings on a row. 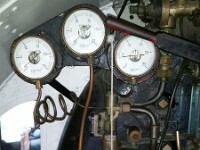 Note they are not evenly spaced. 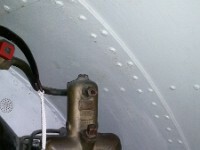 23 A narrow air pipe runs from the air tanks vertically up and then towards the appliances connected to air pump governor. 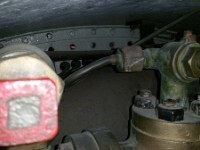 It is related to the automatic control of the air pump: if the pressure in the air tanks drops below a certain level this is communicated via this pipe to a valve in the governor which flips and so starts the pump. 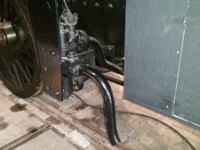 25 The train air pipe for the braking system. 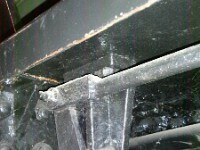 27 Now let us turn our attention to the LHS. 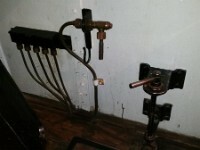 Terribly lit, but you can make out various pipes. 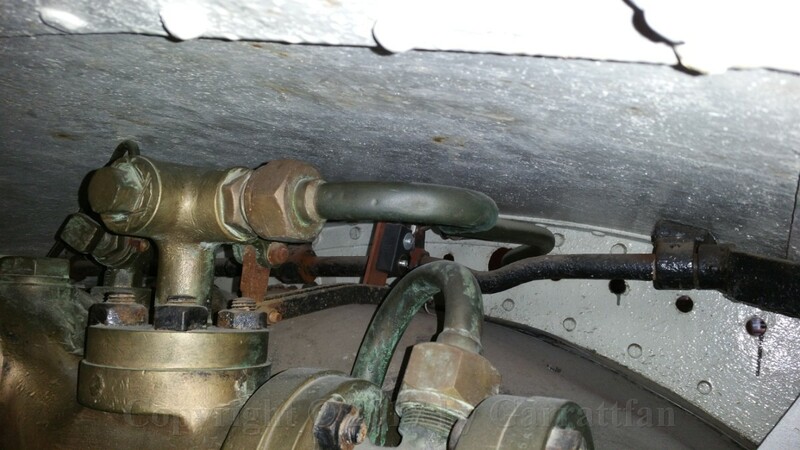 28 I have no idea what these pipes are for.... Two lubricator pipes again leading to the cylinder. 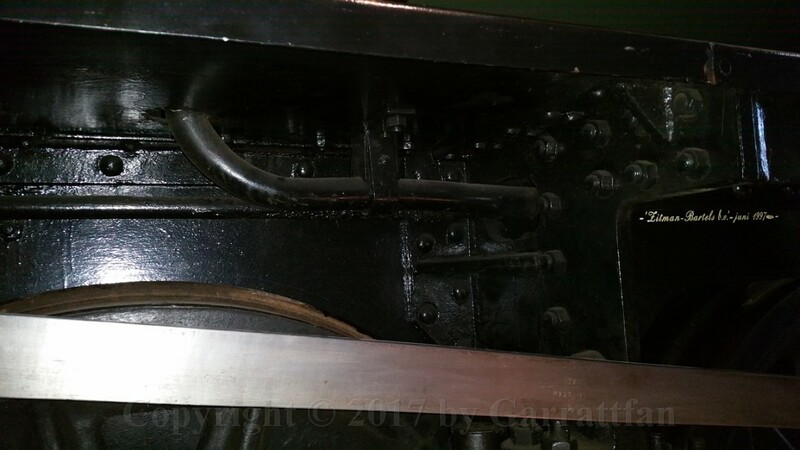 30 Above the running board the arrangement on the LHS is very much the same as on the RHS. 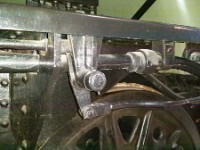 31 The curved lifting arm and the almost vertical reverse arm are operated from the cab via the reach rod. 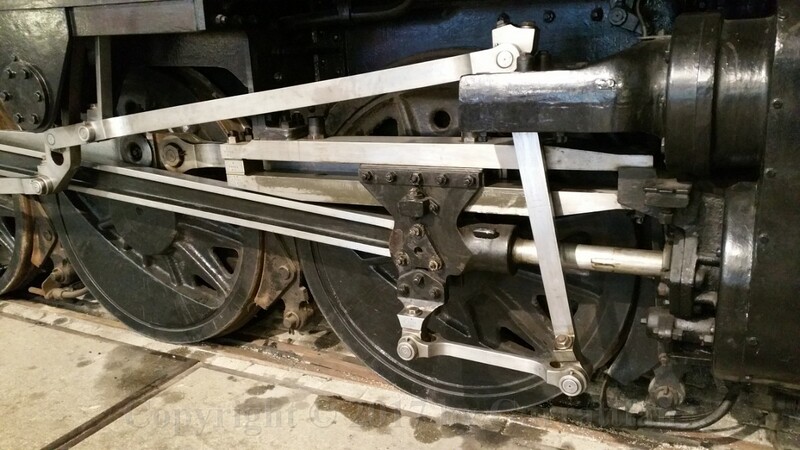 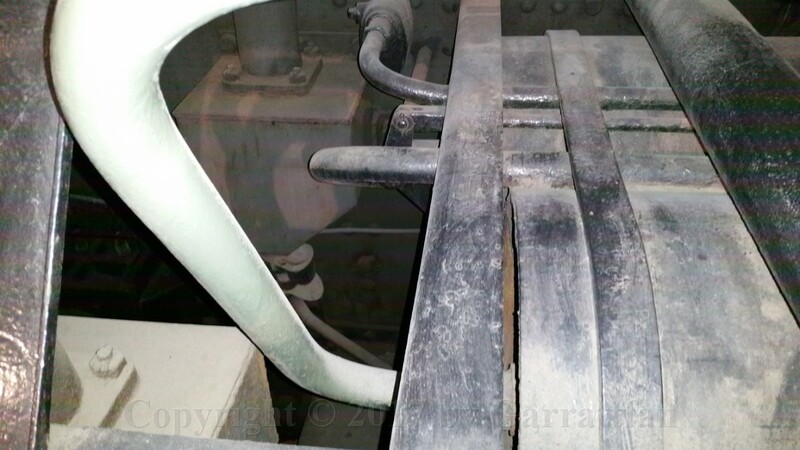 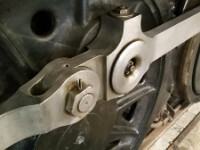 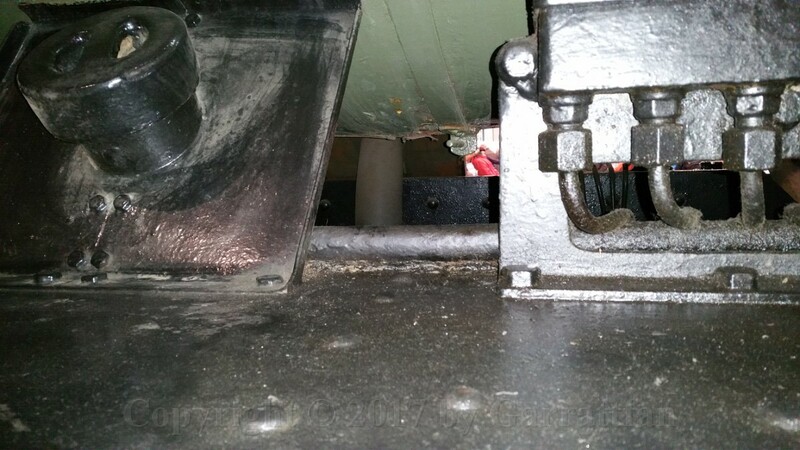 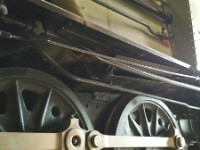 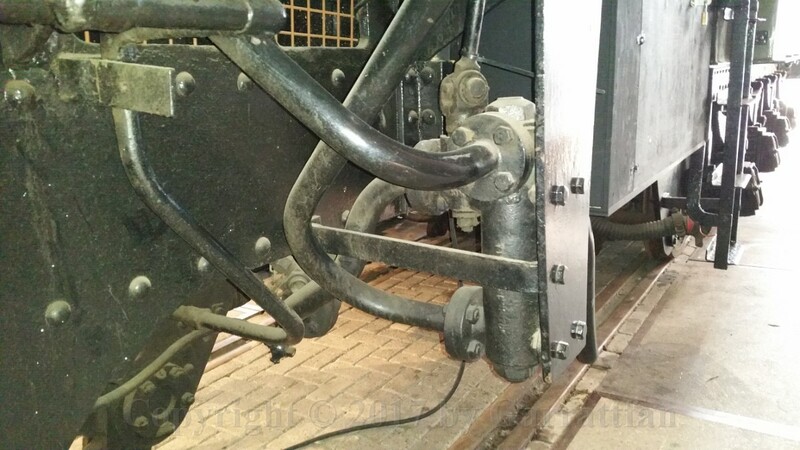 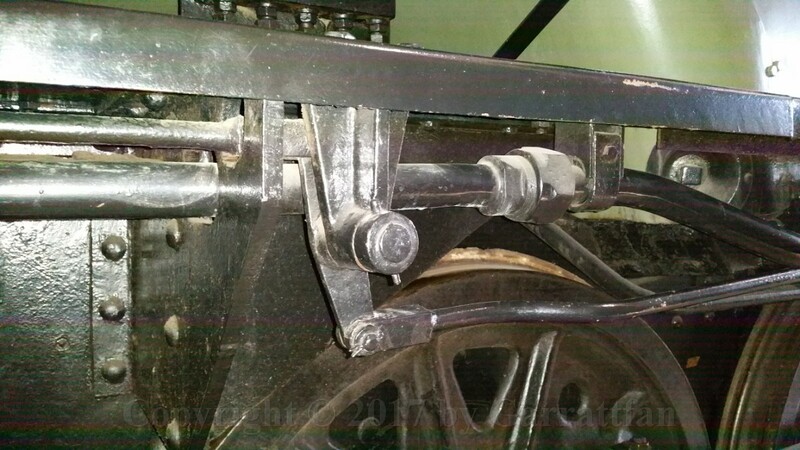 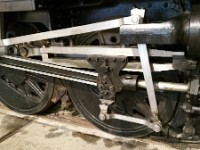 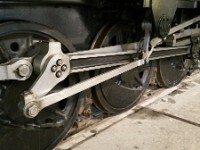 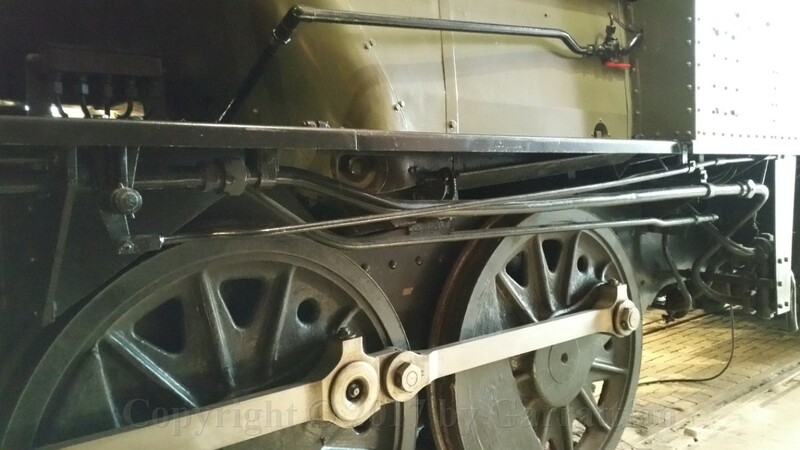 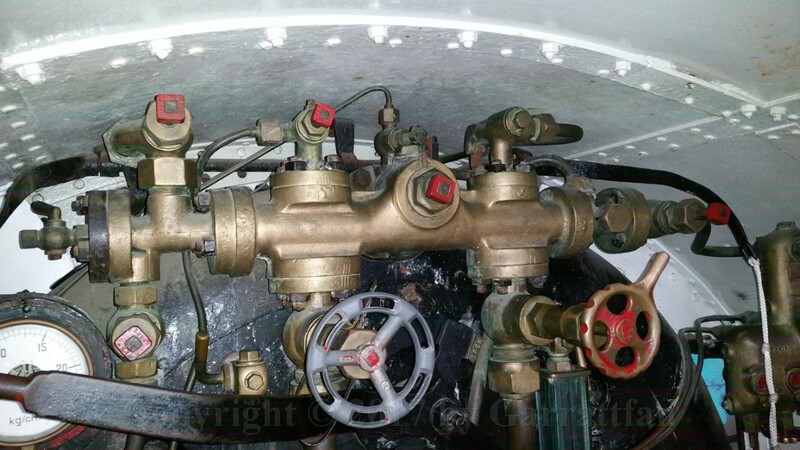 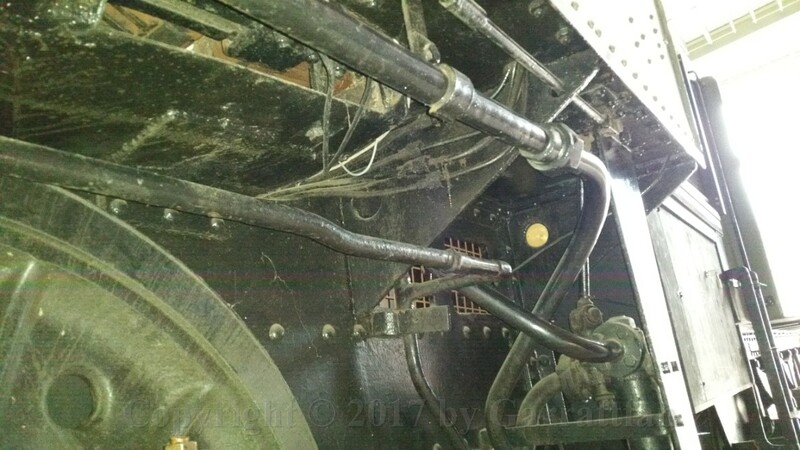 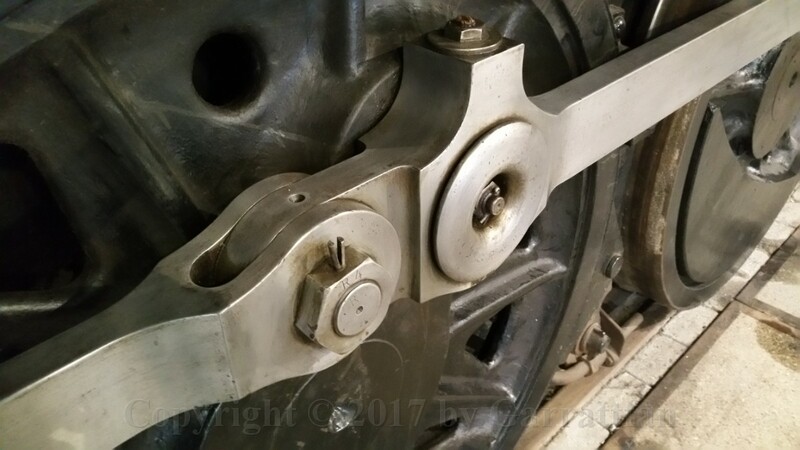 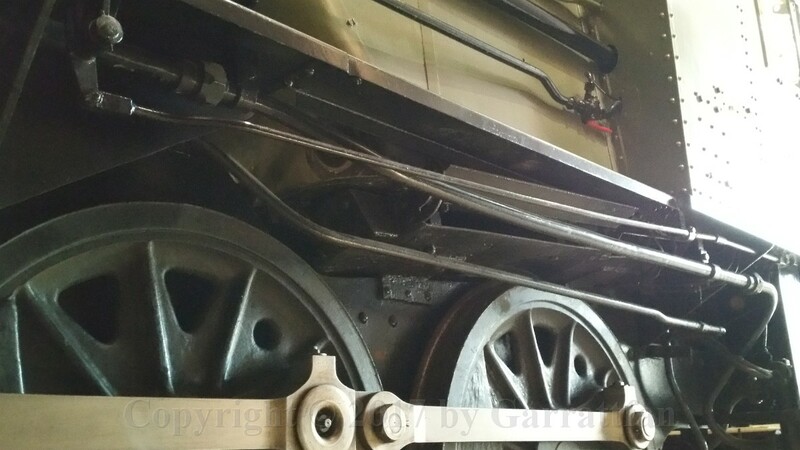 The reach rod is supported in the middle to prevent from sagging and so disturbing the valve gear's cut-off. 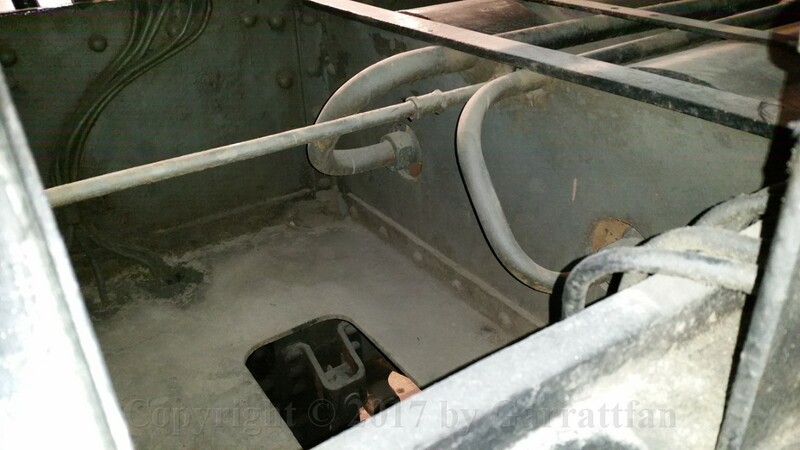 37 Again let's follow the feedwater pipe. 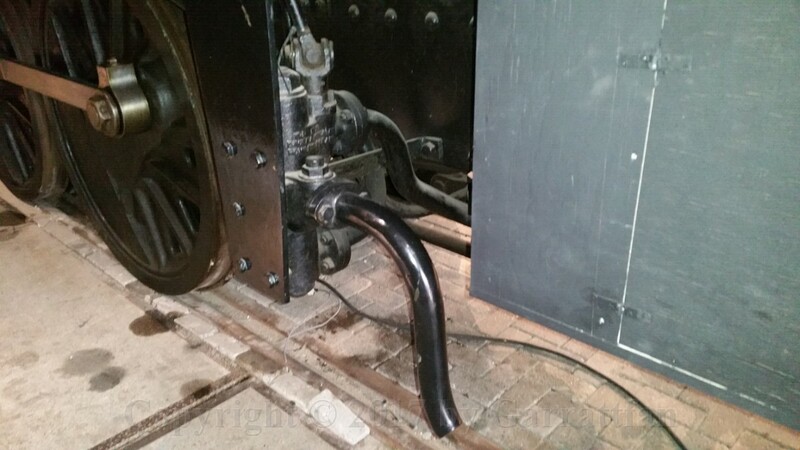 It comes out of the lower end of the injector and curves up tot the running board. 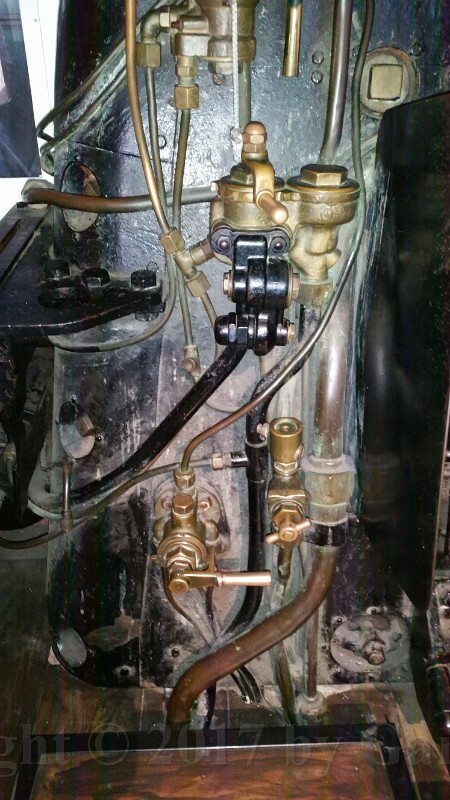 44 Up towards the top feed clack valve. 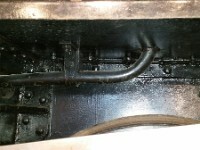 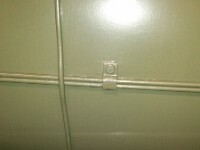 50 This is the brake air pipe running from the brake cylinders to the train. 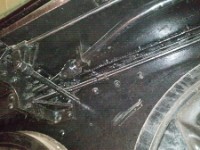 I backtracked it from the cab. 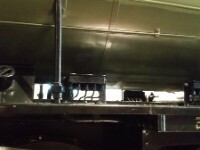 51 In front of the firebox it dives down an starts running on the edge of the running board. 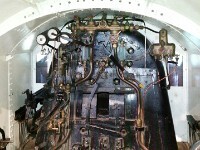 52 behind the oilfeeds and sandbox. 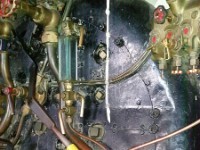 57 To complete the survey of the air pipes I returned to the RHS. 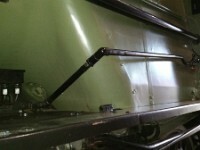 The big green pipe is the main air pipe coming from the air pump. 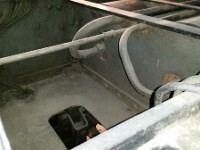 It leads into the first (RH) air tank. 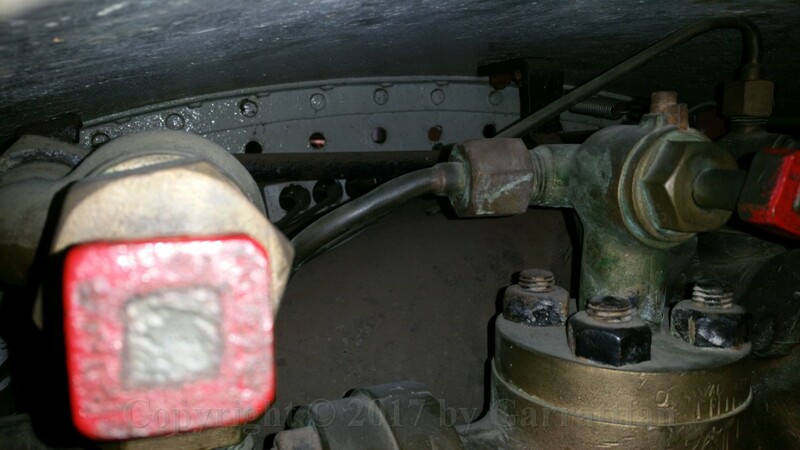 Between the tanks the closest pipe comes from the front of the first tank, runs back and then feeds into the rear of the the furthest (LH) tank. 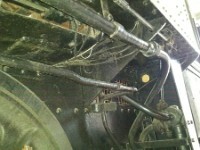 The furthest pipe is, as we have already seen the main air pipe that goes to the cab. 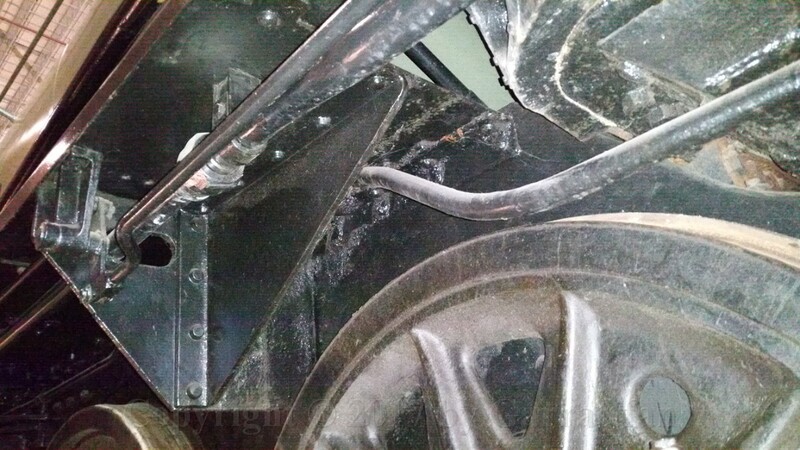 Another interesting thing is that you can see the actual sandboxes inside the frames. 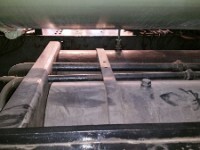 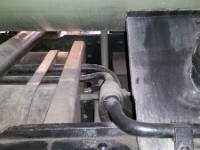 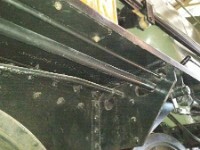 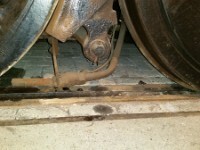 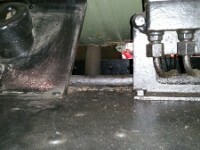 What you can see on the running board are only the filler openings. 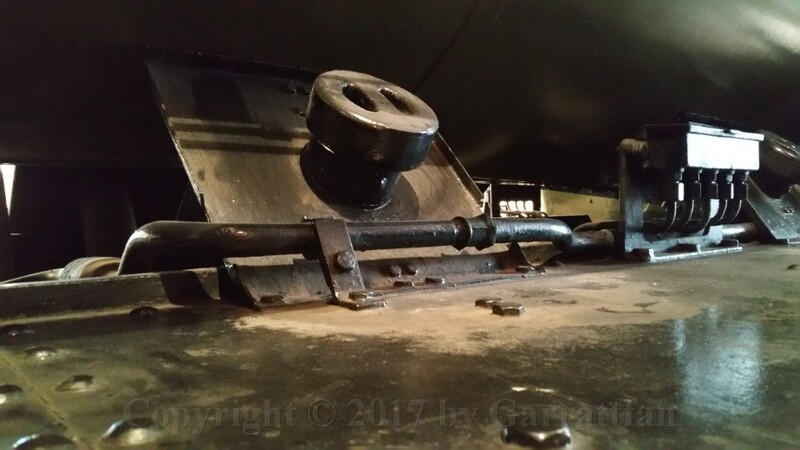 58 A composition of three photos of the cab. 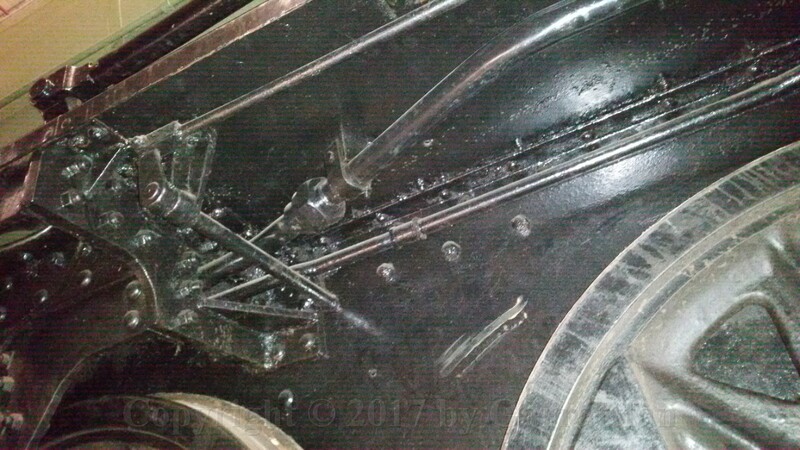 Apart from a few irregularities in the cab floor I think this is a pretty good shot. 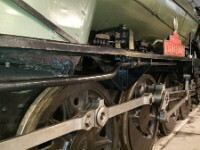 61 The driver is situated at the left which is peculiar because Dutch locomotives had the driver at the right hand side. 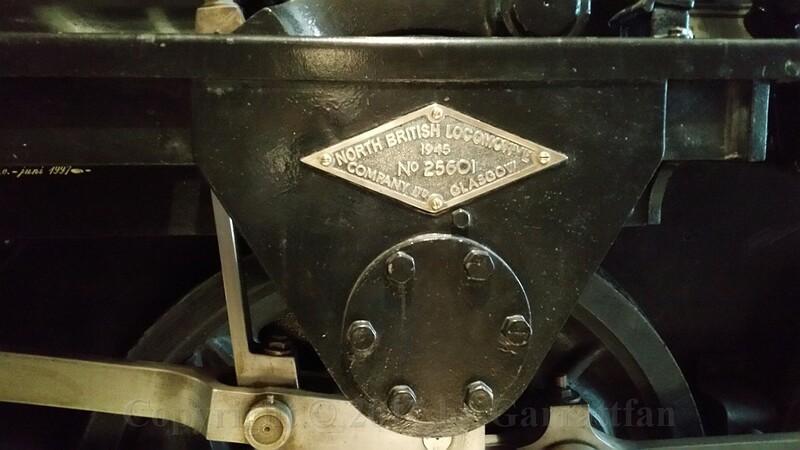 This betrays the UK origin of the loco. 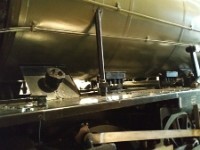 75 A view on the top of the loco to see the arrangement of the steam pipe leading to the air pump. 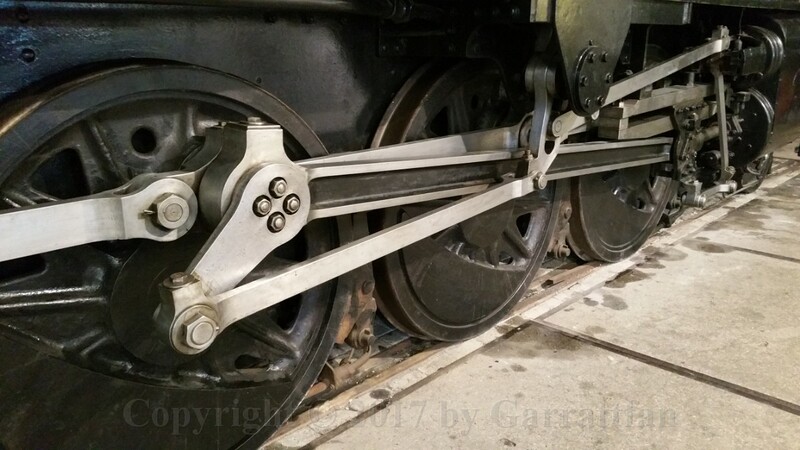 76 A few shots of the (RHS) motion gear. 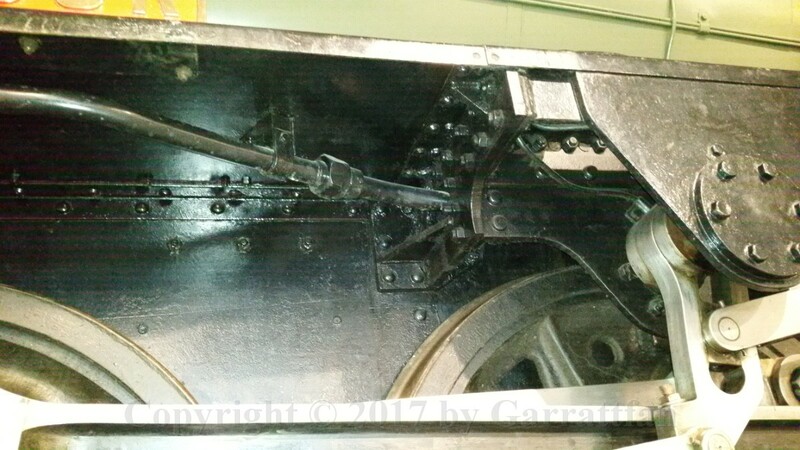 Nothing special here, standard Walschaerts valve gear. 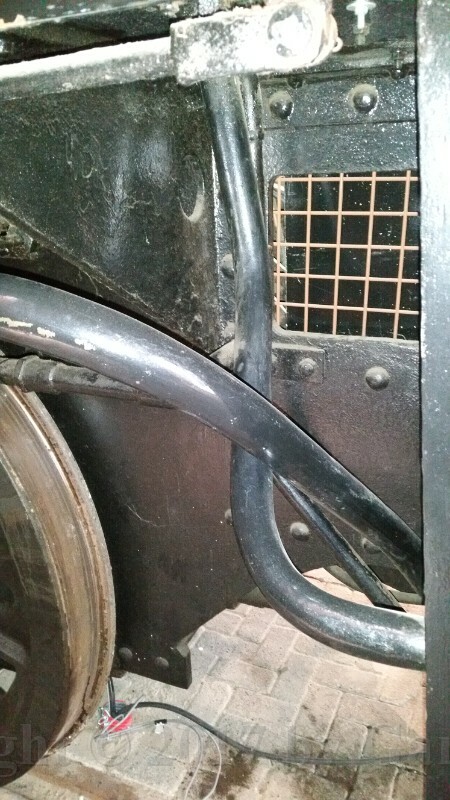 Note how tight the clearance is between the drive rod and the slide bars. 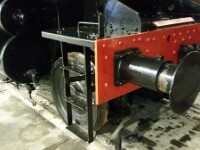 79 A final overview of the loco. 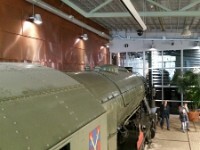 The first nine examples of the 2-10-0 class came on Dutch soil in december 1944 in the liberated south of the Netherlands. 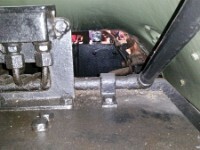 Until the end of 1945 they served the allied troops. 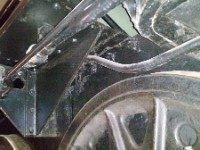 Because there was no immediate purpose for them they were subsequently stored. 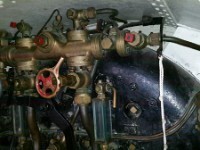 As of January 1946 60 engines were rented by NS from the War Department for civilian use, in may extended by another 50. 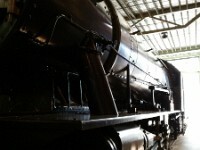 They served mainly in the south and were for a time the mainstay of the traffic there. 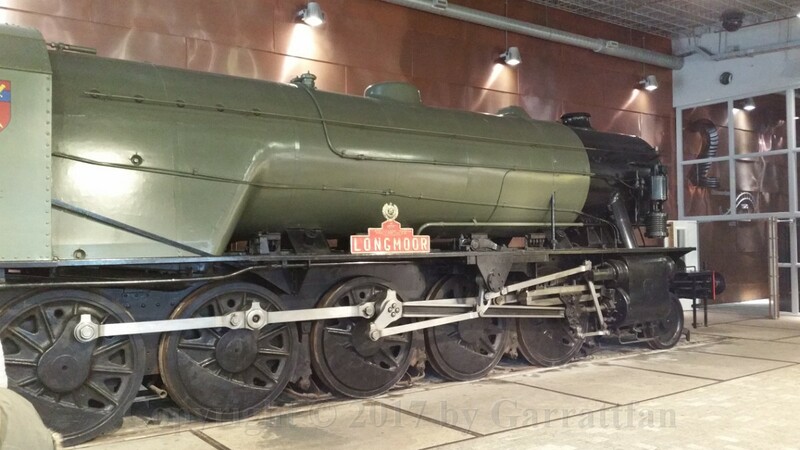 As Dutch steam locomotives became available again after repair of the war damage they were gradually taken out of service. 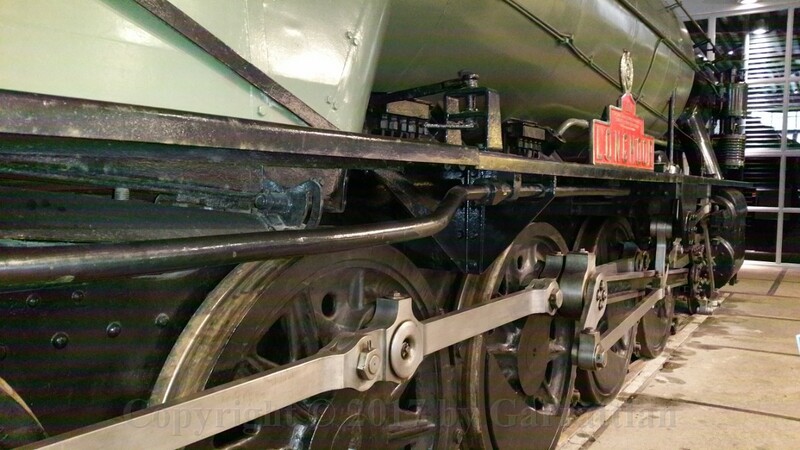 Scrapping started as early as 1948 and in 1952 the last of them had gone. 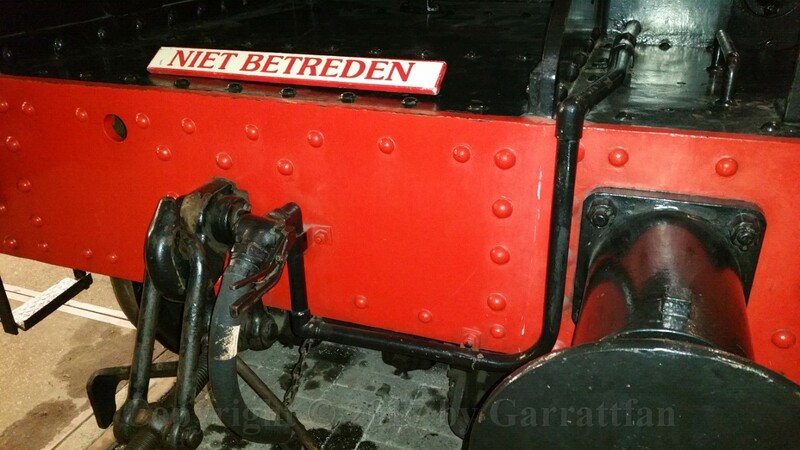 5085 was preserved because it was the 1000th WD locomotive that was deployed on the continent. 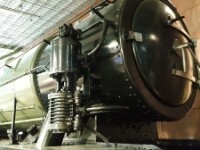 Taken out of service in 1951 she was restored to near orginal condition.